Predators continue to attack livestock in my area. A local producer recently lost over $100,000 in stock. One attack occurred after installation of electric fencing. Addressing the situation, an Ohio newspaper interviewed me for the article below. Although I emphasized that the Caucasian as a *working livestock protection dog* is a territorial guardian that uses only "necessary force" against wolves and coyotes, the caveat that this breed kept as companions must be under control at ALL times - voice control, leash control, or fence control - and that they can be problematic in multidog situations, still applies. The Caucasian is very family oriented with a long history of often working closely with the herdsman. Other livestock guardian breeds may be better suited to remote, open range situations. The Caucasian also tends to exhibit more play behavior than other livestock protection breeds and requires considerable supervision when young. The Caucasian is a wonderful breed but not suited for everyone or every situation. When Stacey Kubyn heard about two vicious attacks on a Russell Township woman's livestock, she immediately wanted to help. In January, three alpacas on Mary Reed's Kinsman Road farm were slaughtered. Reed believes domestic dogs are responsible for that attack as well as an assault last month on four other animals at Chagrin Valley Llamas and Alpacas. Reed believes the way to stop the killings is to catch the animals responsible. Reed was so desparate to find the killers she offered a $1,000 reward on the head of the dogs who attacked her animals. But Kubyn, a Chardon Township resident and Painesville attorney, said there's a better way to make sure the attacks never happen again. "The solution is livestock guardian dogs," Kubyn said. "Guardian dogs are as important to a producer's operation as a tractor is to a farmer. So I called (Reed) up and offered her my assistance. She was more geared toward, 'Let's get the culprits.' But even if you get the culprits, more will come." Kubyn and her husband, Russ - also an attorney - currently house 10 Caucasian Mountain Dogs from Russia on their Chardon Township property. The dogs are an extremely rare breed that have an innate talent for protecting livestock, she said. However, Kubyn quickly pointed out that the animals, who have won numerous national awards on the show circuit don't have killer instinct. "These are not attack dogs," she said, "They're for property protection only. They're very serious about their areas. They patrol, they bark and they urinate. And generally, predators will stay away and find easier prey". "If coyotes or wolves do come up, the dogs will puff themselves up and bark. If needed, they just run the coyote off. These dogs use only necessary force. If a wolf pack is especially hungry and persists, they'll engage in a fight. Killing is only the last resort." Kubyn said she is counting the her mountain dogs - which cost over $1,000 each - to protect the horses and goats she plans on getting in the future. But Kubyn added she's not interested in Reed's dilemma for her own financial gain. In fact, Kubyn suggested Reed would be better off with the gentler and less costly Great Pyrenees instead of her Caucasian Mountain Dogs. Reed said she's considering taking that advice. "She felt a guard dog would be instrumental in my situation and I'm willing to try anything," she said, "I'm totally frustrated." However, Reed worries a guard dog could unintentionally hurt her livestock by rolling over on the much smaller animal, or contaminate her llamas and alpacas through manure. Newbury Township residents Kristine and Tim Knapp lost a pregnant llama in December after a similar assault on their farm. Unlatched gate proves the door to success for top show winner. Had it not been for an unlatched gate, Ch. Cezar of Esquire, aka Ch. Bonzo An-Ro-Ge would never have become the top winning Caucasian Mountain Dog in this country and ranked in the Top 10 among all rare breeds. Six-year-old Cezar was whelped at a kennel in Poland and imported as a puppy to Toronto by a couple of Polish heritage. For a few years, Cezar lived the good life, doing the job he was bred to do -- guard livestock. But his life changed drastically when the farmhouse was destroyed in a fire and his owners moved to the city. Unaccustomed to city ways, natural predator control instincts took over. Cezar attacked and killed a small dog and landed in big trouble - in a humane shelter with a death sentence. Stacey Kubyn of Painesville, a breeder, exhibitor, judge and rescuer of Caucasian Mountain Dogs learned of the incident and contacted the shelter, offering refuge and retraining for Cezar. "I was afraid that the breed would gain a bad reputation," she said. These are not mean, vicious dogs, but because they have functioned as livestock guardians, they will protect the yard from a wolf, a coyote, a mountain lion and the neighbor's dog." The breed is not for everyone. It is a working partner, needing a job to do, and is not a pet in the typical sense. Raised correctly, it can be gentle and patient with well-mannered children, extremely loyal, faithful and protective. This breed is a minimum of 26 inches at that withers, preferably tallker, and weighs 100+ pounds. It is powerfully built and has a medium to long double coat that is shed twice a year. Colors range from shades of gray to reddish to fawn with a dark mask. Kubyn brought Cezar home in the spring of 1995 and began desensitizing him to other dogs and training him to walk on a lead. "He came to us in good health," she siad. "His owners really loved him." When Cezar had learned city manners, Kubyn began training him in the ways of the show world, then sent him off in the fall of 1996 on the show circuit with a professional handler, Megan Kelly of Middlesex, N.J. Rare-breed shows are scattered far and wide, and showing Cezar herself would take too much of Kubyn's time. She is an attorney. In the meantime, through Cezar's tatoo, Kubyn traced him to the kennel in Poland where he was whelped. She learned that he is registered as Bonzo An-Ro-Ge with the Polish Kennel Club. His sire is a Federation Cynologique Internationale champion and one of the most famous dogs in the breed. Kubyn applied for and got full FCI registration for Cezar. "Usually there is a one year time limit for registration, but because he has done so much winning, an exception was made," she said. Cezar was 3 when he began his show career, a little older than most dogs start, but he bagan winning and hasn't stopped. He has 14 best in shows. 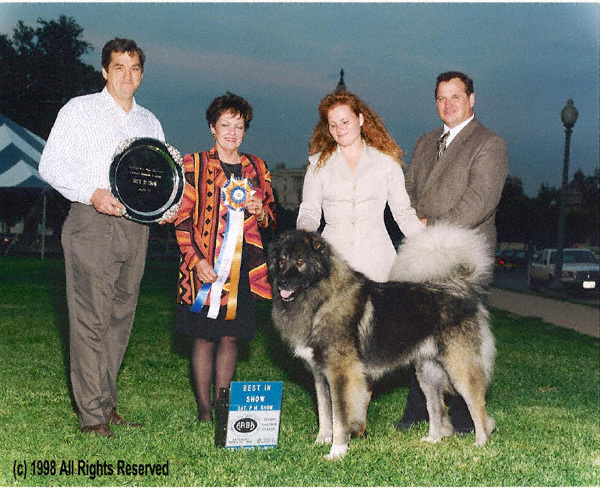 Cezar earned championship certificates in the Caucasian Mountain Dog Club of America and the ARBA. "Cezar is wonderful with people, gentle and loving but stil serious about predator control duty," Kubyn said. Stacey Grether Kubyn of Concord Township has taken the Caucasian Ovcharka, a flock-guarding breed of dog from the Soviet Union, to her heart. The breed is not recognized by the American Kennel Club, but Kubyn wants to preserve and perpetuate it. Rare breeds, it seems, are becoming as numerous in the United States as those recognized by the American Kennel Club. Perhaps it is a desire to own something different or an urge to prevent an ancient breed from falling through the cracks of extinction, that spurs people such as Kubyn to action. A little over 14 months ago, Kubyn owned only a show Rottweiler and a pet German Shepherd. She now owns or co-owns 14 dogs, most of them Caucasian Ovcharkas. They are not, however, all at her Concord Township home. Kubyn is working with a select group of breeders from coast to coast to ensure the dog's geographic distribution. Kubyn had been reading about flockguarding breeds in July of last year, she and her husband, were looking at one, a Kuvasz, for possible purchase. That's when they learned of a broker who had imported several Caucasian Ovcharkas and was looking for a buyer. "It was fate," Stacey said. She looked at the puppies and suggested to her husband, "Let's try it." Kubyn knew little about the dogs, except that they were flock guardians. The broker called them Caucasian Shepherds. They took the dogs home to join the German Shepherd and the Rottweiler. Kubyn imported more Ovcharkas through the broker until she had nine. But she could find out little more about the breed or the specific bloodlines of the dogs that she purchased. After six months, the broker still had not provided a breed standard or any other information she requested. When Kubyn told friends of her plight, one mentioned that a Soviet woman, who judges all working breeds of dogs in the Soviet Union, might be able to help. To her dismay, Kubyn learned that the woman, Elena Kuznetsova, had returned to Leningrad the previous week. In December, Kubyn was able to contact Kuznetsova, a biologist, who is a specialist in methodological education with working dog in the State Kennel Club of the U.S.S.R.
Kubyn learned from Kuznetsova that only 20% of the Ovcharkas in the Soviet Union are purebred. She also learned that some of her original Ovcharkas, although purebred, are not show quality. Kuznetsova is not a broker, but she wanted to help Kubyn obtain the best bloodlines for foundation stock in this country. Although she had never met Kubyn, Kuznetsova purchased several dogs as gifts for her even though one Ovcharka costs many months salary in the U.S.S.R. In the meantime, Kubyn's Rottweiler finished its championship in April and Kubyn passed her Ohio bar exam in May. A lot happened in her life in a short period of time. Kubyn's husband is also an attorney. Kuznetsova, who lives in a one-room apartment, handpicked five Ovcharkas and kept them in her apartment for three months until she could accompany them to the United States in June. It was important not to let them come in contact with other dogs in the Soviet Union, Kubyn said. Whole litters of dogs have been wiped out because parvo vaccine is generally unavailable. Because the dogs were kept in the apartment, Kuznetsova had to perform special exercises with the dogs to keep their muscles from atrophying. The only dog food available was not fortified with vitamin D. So Kuznetsova had to give the dogs shots to prevent them from getting rickets. Waiting from December until June for the dogs seemed an eternity to Kubyn. Even phone calls to Leningrad were a major production; six families in Kuznetsova's apartment building share one phone. "Sometimes I could get through in a day," said Kubyn. "Sometimes it would take two weeks of constant trying." Kubyn is in the process of setting up a registry and national club of the Caucasian Ovcharka in this country. "We hope The United Kennel Club will accept the breed and we have contacted the State Kennel Club," said Kubyn. Kuznetsova is planning to return to Leningrad Sept. 18. She will again handpick Ovcharkas to help Kubyn add to her foundation stock. Kubyn will fly to Leningrad in November, or possibly earlier, to visit Ovcharka kennels and to return with the dogs. One of her goals is to establish excellent bloodlines, to keep the costs reasonable and get conscientious people involved with the breed. Kubyn hopes to find a rancher/breeder who will use the dog for its original purpose of working with flocks. "We don't want to make this breed into Golden Retrievers or gentle giants," she said. "This is a working guard dog that you can leave in the house with children."